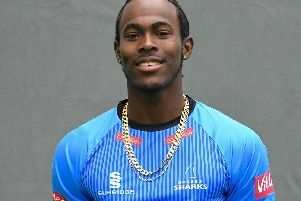 Jofra Archer took eight wickets for just 46 runs as super Sussex bowled out Glamorgan twice in two sessions in little more than 60 overs to wrap up their third straight County Championship victory. Replying to Sussex's first day total of 327, the Welsh county struggled from the start and were skittled out first for 85 - and then, following on, for 88. It was one of the quickest instances of a team taking 20 wickets in county championship history and the 22 points gained propel Sussex into the top two promotion spots. Archer led the way with 4-15 in the first innings and 4-31 next time around, but he was well backed up by Chris Jordan, Ollie Robinson and David Wiese, who took 11 wickets between them as carnage ensued. In Glamorgan's first innings only Chris Cooke (32) and Lukas Carey (17) got into double figures and when Glamorgan went back in, Kiran Carlson (22) and Aussie Usman Khawaja (19) were the only relative successes. Sussex will be sorry they now take a break from the championship to concentrate on the Vitality Blast, but they have set up an exciting end to the season with promotion back to the top division a distinct possibility. This was Sussex's third straight win and they achieved it by taking 20 Glamorgan wickets in two sessions, the two innings neatly divided by the first 40-minute interval. It was a day-night game but the floodlights were not required as the match was wrapped up by 7pm. It was a disappointing performance by bottom side Glamorgan, with only one win this season. But they ran into a Sussex side with too much firepower in their attack, with Archer, Robinson and Jordan all outstanding. It was appropriate that the match was completed by its outstanding player, Archer, who uprooted Carey’s middle-stump. Sussex coach Jason Gillespie said: “I can’t remember a performance like that. It was pretty special.The boys should be really proud of themselves. I’ve been around county cricket quite a while and that bowling performance was brilliant, as good as I’ve ever seen. “We were ruthless on that off-stump. And when you stick to your disciplines you get rewarded. We keep challenging ourselves to get better. It had been Archer who had propelled Sussex towards their sensational day with a devastating burst that brought him four wickets for four runs in just 11 deliveries as they were bowled out for 85 before lunch in response to the Sussex innings of 327. When Glamorgan followed on after the interval, 242 runs behind, the pattern didn’t change. They continued to lose wickets steadily against a Sussex bowling attack that gave them little respite, bowling straight and making them play. Openers Nick Selman and Jack Murphy fell in successive overs, the first bowled by Robinson for two and the second caught behind for a duck as he played hesitantly forward to Archer. Connor Brown was third out at 15, lbw to Archer as he attempted to work a straight delivery to leg. And Khawaja failed again, this time mistiming his pull shot to give Phil Salt a good running catch. Cooke edged Jordan for Salt to take another good catch, this time tumbling to his left at third slip. And then Jeremy Lawlor was beaten and bowled as he played forward to Jordan. When Robinson replaced Jordan at the Cromwell Road end he immediately bowled Carlson through the gate and the tail followed quickly.